Shinbashi (also Shimbashi) Station in Tokyo. Designed by American architect Richard P. Bridgens (1819-1891), Shinbashi was the original terminus of Japan’s first railway, the Tokaido Main Line, connecting Yokohama with Tokyo. 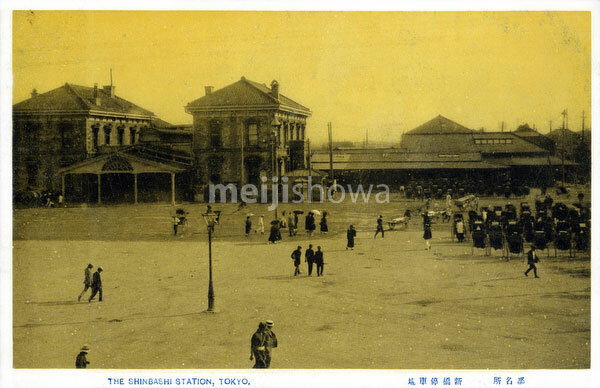 It was opened on October 10, 1872 (Meiji 5) and named Shinbashi Teishajo. In 1914 (Taisho 3), the station was demolished to make way for a goods yard named Shiodome Station. Shiodome Station closed in 1986 (Showa 61) and in 2003 (Heisei 15) a reconstruction of the original Shimbashi Station was completed.